Will Christ return before or after the Great Tribulation? This is a question that draws ire from many of the rapture based churches. How dare we question man’s traditions. The Second Advent is a major doctrine of both the Old and New Testament. Of the numerous passages in the Old Testament my favorites can be found in Daniel 7:13-14 which states that the Second Coming marks the termination of the times of the Gentiles and the beginning of the reign of God’s kingdom on earth and Zechariah 2:10-12 which covers not only the 2nd Advent but Christ’s inheritance in the Holy Land in the city of Jerusalem. 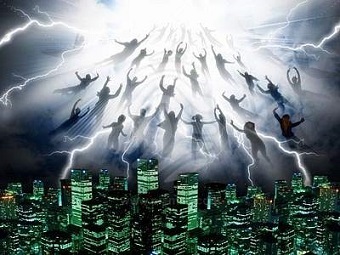 While the Old Testament speaks only of a Second Advent, churches that push the rapture doctrine try to convince their followers that God has revealed a secret Advent in the New Testament, one in which Christ returns to rapture out his children before the great Tribulation and before the fulfillment of prophecy of his 2nd Advent in the Old Testament. However, the Bible only teaches two Advents. Hebrews 9:28 distinctly tells us that for those who wait for Him, He will appear a second time – there is no third Advent mentioned, secretly or otherwise. In Matthew 24, Mark 13 and Luke 21, Christ tells his disciples what to expect before His return and nowhere does He mention rapture. As a matter of truth, Christ is adamant that His elect will be delivered up to the anti-Christ for a testimony, and assures them that they have nothing to worry about because as it is written in Luke 21, v. 15, He shall “give you a mouth and wisdom, which all your adversaries shall not be able to refute nor resist,” that mouth being the Holy Spirit speaking through you. It would be extremely hard for God’s elect to testify if they are no longer on this earth during this period. We also read in Rev.9:5 that the tribulation was shortened to five months, a second witness to Matthew 24:22 in which Christ said “except those days be shortened, there should no flesh be saved (from the deception), but for the elect’s sake those days shall be shortened.” Again, why shorten the days of the Tribulation if God’s children are gone? ← Are these Civil Rights? I am a long time student of the Shepherd’s Chapel also study with Mark13Records on youtube.